We urgently need an energy transition. We have few years left to fundamentally change our energy systems. There is no energy transition currently in course, whether just or unjust. 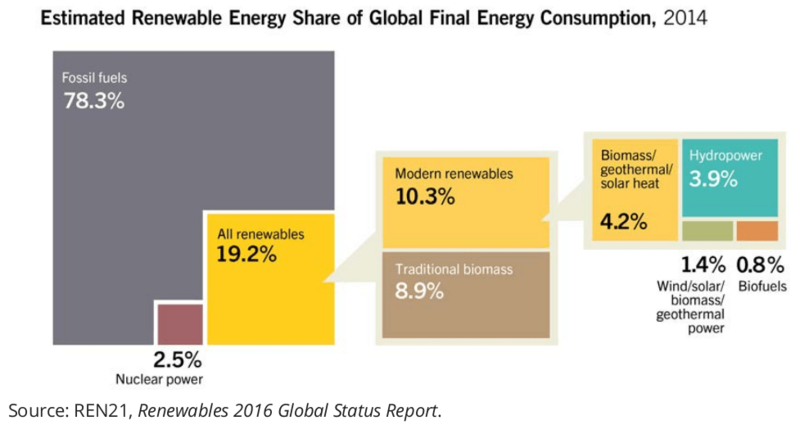 If everything goes well with the government commitments, the marvellous increase in modern renewable energies would reach 20% of world energy supply in 2035. Despite all the green marketing, the truth is that the governments are not shutting down fossil fuel infrastructures, and they continue planning new ones. Understanding that there is no no transition in course is important, because whoever says that it’s happening says it for purely ideological reasons, as it is not based on facts. The narrative about a possible green growth in which capitalist markets and a livable planet would be compatible not only demobilizes the people but also creates an ambition gap in social movements. Which takes me to my third point: we have to make this transition happen. What is at stake is not a choice between just and unjust transition, but between a just transition and climate chaos. And to make this happen, we have to make climate change a problem of the people. This is the topic I will focus on in this text: how to make the struggle for energy transition a concrete struggle in the lives of the people. I will further focus on workers and unions. There are two forms of union intervention for energy transition: Firstly, as whole workers, that is, as member of the working class and not just employees of a company. This kind of intervention is quite common all around the world. This is a subject which is directly related to the lives of the workers and the communities, and the unions already have a long history of social and political intervention beyond the conflicts within the working places. Some well known examples are anti-war movements, struggles against privatizations, gender equality fights and the recent mobilizations against free trade agreements. Union struggles also include a strong component of influencing and challenging government policies, as in the cases of anti-austerity movements and annual budget negotiations. In this case too, the union intervention goes beyond the immediate conflicts inside the working places and assumes a general vision on the direction the society will take. Secondly, there are workers in frontline sectors of climate crisis. Energy and transport are key sectors for the energy transition, where some jobs will be lost and many many more will be created. Particularly in public transport and renewable energies, studies predict multiple times more jobs than the fossil fuel industry offers. On the other hand, the workers in the forestry, agriculture, public health and firefighting are those who directly confront the impact of climate change. The labour organisations of these workers are essential to alert the society about the right path to take. To articulate social and climate justice, we have the Climate Jobs Campaign which unites environmentalist organisations and unions. We see the campaign not just as what should happen, but as what we will make happen. It is a concrete, positive proposal, to which we would say “Yes”, which puts us in the offensive position (rather than defensive). It talks about just transition and includes workers and communities which at the moment depend on fossil fuel industry. It unites environmentalists and workers, breaking the false dilemma between jobs and sustainability. It demands thousands of new and decent jobs. It represents a real solution to the climate crisis. It sees climate as a common wealth and assumes a “public service” vision. With theses strategic advantages, we now pass to examples of successful alliances and union interventions around the world. As in the first section, I will classify the examples as whole worker interventions and frontline worker interventions. In the Basque Country, the unions addressed fracking not only as workers but also defenders of the community. Thus, they led the fight against fracking together with various other organizations, and had quite a few victories. In France, the unions of the platform Emplois-Climat (Jobs-Climate) mobilized against the new labour law proposals which was to make the work conditions even more precarious. Thus, the unions used the campaign as a proposal against precarity. In Portugal too, the 2nd National Gathering for Climate Justice had CGTP-IN and the Precarious Workers’ Association in a session on labour precariousness and planetary precariousness. In Norway, unions and environmentalists unite for the 1st of May march. The Portuguese climate jobs campaign was indeed launched on a 1st of May protest 2016. In the UK, the Public and Commercial Services Union has a very active role in the One Million Climate Jobs campaign. 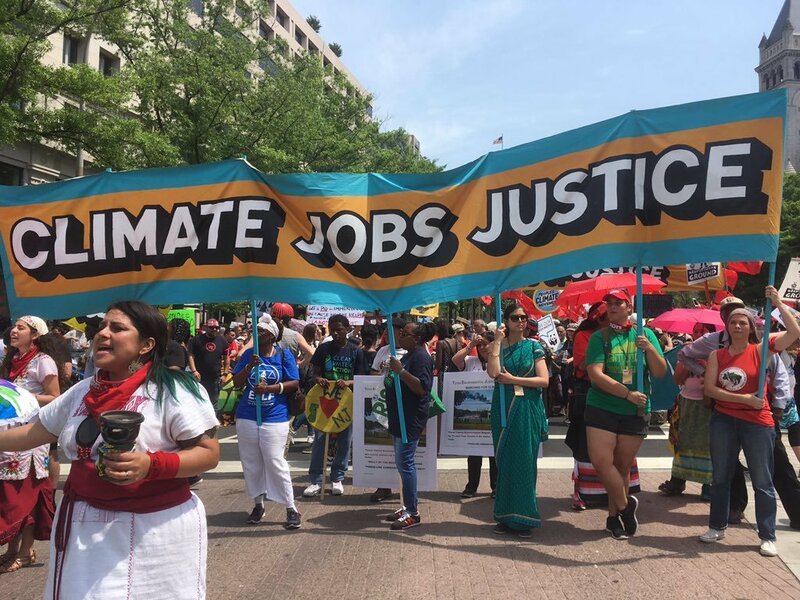 The unions defend a National Climate Service, which would include climate jobs but also the whole social service organization to maintain these. In New York, after the Sandy hurricane, the movements did not allow the issue to disappear from public agenda. More recently, unions signed an agreement with the governor to create thousands of climate jobs in the construction and building sector. All around the world, the Climate Jobs campaign participate actively in the climate marches. In Norway, the Bridge to the Future coalition prepared a pledge for the candidates in the general elections, in which one of the core demands was the creation of climate jobs. After these cases where environmentalists and unionists used the campaign as a tool for intervention in various areas, let us now move on to the frontlines. In the United Kingdom the One Million Climate Jobs campaign gained huge visibility when Vestas wanted to close down a series of wind turbines. 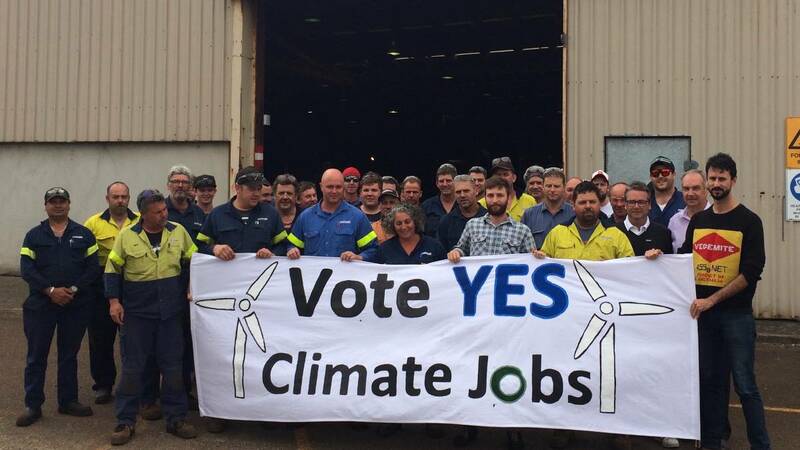 The workers and activists called for an occupation of the turbines, to defend the work and the climate at the same time. In many parts of the world, fights for public transport could translate into such alliances. In South Africa, coal miners involved in the One Million Climate Jobs campaign reject political blackmails against their employment. Instead of fighting against environmentalists, the unions support and defend the campaign as the solution for a just transition, and they thus have the support of the climate movement too. In the United Kingdom, whenever a huge storm hits the land and several cities are affected by floods, the firefighters union alerts about climate change. The union underlines that if we don’t take action on time to reduce the emissions, we will reach a point that there will never be sufficient amount of firefighters to deal with what is to come. Similar approaches could work with forest fires in Southern Europe. In New York, the construction workers are demanding energy efficient buildings and the creation of climate jobs in this sector. The International Transport Workers’ Federation offers a training kit about the climate crisis and jobs, designed particularly for transportation workers. In the United Kingdom, the Public and Commercial Services Union proposes training for the next jobs as part of collective negotiations. For instance, the workers in an oil refinery can demand training in renewable energies as part of their collective negotiation. This is one way of addressing the administrative challenges of the energy transition and preparing the workers for a low carbon economy. These are only some examples of tactics for the fight for a just energy transition. The essential aspect at this point is that neither the labour movement nor the climate movement can alone win the fight against climate change. We need to keep reinventing and updating alliances to build the movement large and strong enough to change everything. Adapted for CAN-EECCA from the original article in portuguese. Como foi explicado num artigo anterior, a crise climática é especialmente perigosa por causa da sua natureza irreversível.4 Focaremos, portanto, a nossa atenção nas alterações climáticas, ainda que a maior parte da argumentação possa ser aplicada à crise ecológica no geral. §4. O valor de troca domina: A integração capitalista é a integração do valor de troca em todas as esferas da vida, e a desintegração de todos os outros valores da vida. O sistema financeiro, onde a “sustentabilidade” das formas monetárias (em vez de objectos reais) é o objectivo principal, é a subordinação final do valor de uso ao valor de troca. §5. Alienação: O capital não vê nada senão mercadorias. O capital tende a ver mercadorias para onde quer que olhe. O capital reduz as mercadorias a valores de troca. Isso tem dois tipos de impactos. §6. O capital vs. A Natureza: As características do capital e as da natureza são intrinsecamente antagónicas. O capital caracteriza-se pela divisibilidade (a forma monetária pode ser dividida em peças tão pequenas quanto se quiser), pela equivalência (os valores de todos os objectos são comparáveis nos seus preços), e por ser ilimitado (ver §3.). Por outro lado, a natureza compreende-se melhor em temos holísticos, sendo diversa e limitada. Este antagonismo torna o capital incompatível com os sistemas terrestres. §7. Socialização e individualização: Através da socialização do processo laboral, o capitalismo emancipou os seres humanos dos seus constrangimentos naturais. Criou um metabolismo social onde a interdependência é a característica fundamental, ao mesmo tempo que cada indivíduo está ao abrigo de condições externas: quando estamos doentes, vamos ao hospital; quando precisamos de electricidade, basta acender a luz. Quando precisamos de água, abrimos a torneira. Quando um desastre acontece numa qualquer parte do mundo, acreditamos que cabe aos outros países ajudar. Ninguém no mundo de hoje utiliza apenas os materiais produzidos na sua própria comunidade, etc. §9. Voltemos agora aos limites históricos e às fronteiras planetárias, tendo em conta os antagonismos do capitalismo. §10. A resposta capitalista aos seus limites históricos: A atitude geral do capitalismo face aos seus limites históricos foi condicionada pela sua mono-dimensionalidade: fazer mais do mesmo, exactamente da mesma maneira, e esperar que o problema se resolva. Para começar, inventaram-se necessidades desnecessárias, como carros cada vez maiores (para andar em média a 15km/h nas grandes cidades), ou todo o tipo de materiais descartáveis. Depois, inventaram-se empregos desnecessários, como a protecção de copyright14 e a publicidade em massa. Depois, a obsolescência programada promoveu o “descartável” a “tem-de-ser-descartado”.15 Na frente ideológica, isto é acompanhado pela mercantilização de tudo, pela redução dos ecosistemas aos “bens e serviços ambientais” (assim quantificados em termos de valor do mercado, e assim inseridos numa análise de custo-benefício16), e pelas privatizações. §11. A resposta capitalista aos problemas ambientais: A resposta imediata das corporações à crise climática foi encontrar, fundar e/ou financiar ONGs que serviriam para “sensibilizar” em relação à crise criada pelas próprias corporações, concentrando-se em soluções individuais e desviando a atenção dos problemas sistémicos de fundo. As respostas mais sofisticadas incluíram ainda mais financeirização, como mercados de carbono, mecanismos de REDD+ e as compensações do carbono. Esta última resposta foi muito além das distopias, onde alguém é alegremente convidado a comprar para ser boa pessoa, pagando um valor consideravelmente mais alto por um produto para que uma percentagem minúscula do lucro financie a compensação de alguns dos efeitos negativos desse mesmo produto. Quando a opressão falha, o passo seguinte é a negociação, para deixar o status quo inabalado. A dimensão enorme da crise climática exigiu um processo de negociação e de sofisticação mais complexo. Cimeiras atrás de conferências atrás de cimeiras. Mais e mais relatórios optimistas foram aparecendo.18 Fez-se muito barulho. Muitas “vitórias” foram declaradas (sendo as mais emblemáticas Quito e, recentemente, Paris). Contudo, as emissões de gases com efeito de estufa continuaram a aumentar e o aquecimento global continuou a acelerar, ultrapassando limiares sucessivos. §14. A experiência Soviética: A União Soviética, a primeira experiência socialista na história mundial, nasceu com dois constrangimentos estruturais para a construção de uma nova civilização. O primeiro foi o falhanço da revolução europeia que se esperava a seguir, o que isolou a revolução de uma sociedade maioritariamente camponesa com baixo nível de industrialização. O segundo constrangimento foi ver-se entalada entre a necessidade imediata de uma reconstrução massiva depois da desastrosa 1.ª Guerra Mundial e a necessidade urgente de preparar a indústria e a sociedade para confrontar o exército Nazi na 2.ª Guerra Mundial. Estes dois constrangimentos levantaram o problema premente da rápida industrialização e expansão da economia Soviética. §15. Dognat’ i Peregnat’: A solução política que os líderes Soviéticos encontraram foi “alcançar e superar” as economias capitalistas. Os modelos Tayloristas foram implementados nas fábricas, as experiências de auto-gestão foram descartadas. A curto prazo, esta fórmula política parecia funcionar: a produção aumentou, a economia Soviética “saltou por cima”, literalmente, da Grande Depressão (deixando perplexos os líderes políticos do mundo inteiro e tornando mainstream a economia planificada até nos centros capitalistas), e a URSS conseguiu resistir e expulsar a tentativa de ocupação Nazi que se seguiu poucas décadas depois. §16. A longo prazo, no entanto, estas escolhas reproduziram a alienação dos trabalhadores tanto em relação aos seus produtos como ao seu acto de produção. Como não havia questionamento posterior destas escolhas, o modo de produção da União Soviética tornou-se capitalista na forma (reproduzindo a alienação), com conteúdo socialista (a mais-valia colectivizada). Esta abordagem anti-dialética resolveu-se a si própria gradualmente, com a forma a ditar o conteúdo. A forma e o conteúdo foram reconciliadas com Glasnost e Perestroika. §17. Outras experiências socialistas: Algumas destas políticas Soviéticas foram depois postas em causa em Cuba (após a dissolução da União Soviética e da crise do petróleo que se seguiu), mas continuaram praticamente intactas noutros exemplos até bem recentemente (particularmente na China). Mais recentemente, os governos da Bolívia e do Equador desenvolveram abordagens radicalmente diferentes, ao incluir os direitos da natureza na Constituição dos seus países. Estas últimas experiências têm as suas próprias contradições latentes, especialmente ao terem lugar em economias completamente inseridas no sistema capitalista. §18. Críticas anti-comunistas: As críticas ecológicas anti-comunistas às experiências socialistas incidem essencialmente na reprodução da lógica de produção capitalista. No entanto, estas críticas omitem, muito convenientemente, este lado das suas análises, lavando na verdade a imagem da ideologia capitalista. §19. Críticas anti-Marxistas: Um pré-requisito universal para qualquer discurso anti-Marxista é nunca ter lido Marx. O mesmo se aplica na área da ecologia. No pior dos casos, os críticos anti-Marxistas desconhecem conceitos-chave da análise de Marx, tais como o da “ruptura metabólica”20, o da “alienação dos trabalhadores, a “eliminação gradual da diferença entre cidade e campo, por uma distribuição mais justa da população pelo país”21, etc, e lêem Marx com os seus próprios olhos positivistas e mecânicos. No melhor dos casos, parecem culpar Marx e Engels pelo seu optimismo revolucionário: de facto, estes revolucionários julgavam que o capitalismo seria derrotado muito antes de os problemas ecológicos se agudizarem desta forma. §20. Em qualquer dos casos, abandonar a análise marxista da História deu lugar a um entendimento estático da crise climática. Um subproduto importante desta confusão ideológica da política ecológica é que, uma vez removida da análise a luta de classes como motor da História, o movimento pela justiça ambiental acaba com um problema de agência. Isto levou a abordagens moralistas e muitas vezes despolitizadas. §21. Marxismo e Ecologia: Ao longo das últimas décadas, surgiram dentro do Marxismo duas correntes que integraram a perspectiva ecológica nas suas análises. Uma é a escola de Ecologia Marxista (encabeçada pela revista Monthly Review) e a outra é a Rede Eco-socialista (por exemplo, na coligação System Change Not Climate Change).22 Estas correntes dão ênfase à unidade orgânica dos seres humanos com a natureza (contra a dicotomia natureza versus seres humanos), politizando o discurso das “necessidades”,23 questionando a produção industrial enquanto única forma de criar valor (isso seria capitalismo), e reintroduzindo ferramentas políticas essenciais como o tempo livre e a racionalização e planificação da economia. Do ponto de vista teórico, identificam também os elementos da super-estrutura que reproduzem as relações de produção capitalistas. §22. O caldeirão das lutas ambientalistas e anti-capitalistas: A crise climática, com a sua componente de urgência, torna visível duas limitações com que se depararam os ambientalistas até agora. Em primeiro lugar, a transformação radical necessária, do ponto de vista social, económico e ecológico, para travar o aquecimento global exclui automaticamente qualquer solução “dentro do sistema”. Os únicos caminhos realistas apontam para $1,1 biliões de activos abandonados na próxima década e é tecnicamente impossível fazer isto de uma forma economicamente suave.24 Em segundo lugar, é cada vez mais evidente que não se pode ganhar a luta climática sem ganhar “tudo”. As soluções passam por transformações profundas dos métodos de produção, de distribuição e de consumo, a todos os níveis. Por seu lado, isto implica confrontar as maiores empresas do mundo (a maior parte das quais está directamente ligada aos combustíveis fósseis). Por outras palavras, ou transformamos nós próprios as nossas sociedades em todos os seus aspectos (energia, transporte, alimentação, etc), ou as alterações climáticas transformarão tudo por nós (secas, tempestades, falhas de infraestrutura, refugiados climáticos, etc).25 Em resumo, começa a ser impossível ser-se ambientalista sem se ser também anti-capitalista. §23. Soluções verdadeiras e soluções falsas: As soluções verdadeiras para a crise climática têm de, pelo menos, confrontar as tendências capitalistas de comercialização e maximização do lucro. Na verdade, isto pode ser usado como teste decisivo para distinguir as soluções reais das soluções fáceis. Seguem-se alguns exemplos que apontam direcções ideológicas opostas. §24. Temos de nos lembrar sempre de que a crise climática é uma crise social. * Artigo originalmente publicado no Praxis a dia 10 de janeiro de 2018. 1 Fred Magdoff, John Bellamy Foster, What Every Environmentalist Needs to Know About Capitalism, Monthly Review, Volume 61, Número 10 (Março 2010). 2 Johan Rockström, et al., “A Safe Operating Space for Humanity,” Nature, 461 (24 de Septembro, 2009), 472-75. 3 Danger zone: Earth crosses four planetary boundaries, Climate & Capitalism, 15/01/2015. 5 Hans G. Despain, Secular Stagnation: Mainstream Versus Marxian Traditions, Monthly Review, Volume 67, Número 04 (Septembro 2015). 6 Fred Magdoff, John Bellamy Foster, Stagnation and Financialization: The Nature of the Contradiction. Monthly Review, Volume 66, Número 01 (Maio 2014). 7 Este parágrafo padece de erros teóricos e falhas devidas à simplificação excessiva e a omissões que escolhi fazer de forma a sublinhar alguns aspectos da teoria marxista relevantes para o nosso contexto. 8 A força de trabalho também é uma mercadoria. Um proletário é alguém que vende a sua força de trabalho para sobreviver. No entanto, o tempo de trabalho necessário para produzir os bens de necessidade diária de um trabalhador é menor do que o seu número de horas de trabalho diário. A diferença, ou seja, a mais-valia gerada pelo trabalhador, é apropriada pelo capitalista que comprou a sua força de trabalho. 9 Karl Marx, The Economic and Philosophic Manuscripts of 1844, Tradução inglesa de Martin Milligan, International Publishers, New York, 1964, p.167. 10 Karl Marx, Capital Volume 1, Marxist Internet Archive, http://www.marxists.org/archive/marx/works/download/pdf/Capital-Volume-I.pdf , p.104-105. 11 Uma nota fundamental: uma tendência comum é deduzir, desta análise, que “M – D – M é bom, D – M – D é mau” (este é também o principal argumento ético contra as políticas neoliberais). Esta dedução está errada. Não há aqui dois ciclos. A dinâmica do mundo das mercadorias é … M – D – M – D – M – D… . Esta dinâmica engloba a circulação de mercadorias e a circulação de capital. Os resultados deste parágrafo são, portanto, as consequências analíticas de uma estrutura sócio-económica em que as pessoas se relacionam umas com as outras enquanto proprietários de mercadorias. 12 John Bellamy Foster, Marxism and Ecology: Common Fonts of a Great Transition, Monthly Review, Volume 67, Número 7 (Dezembro 2015). 13 Karl Marx, The Economic and Philosophic Manuscripts of 1844, Translated by Martin Milligan, International Publishers, New York, 1964, p.112. 14 Isto tem uma importância particular. O famoso motivo da competição, que é suposto ajudar a produzir cada vez mais bens, causa o mair constrangimento possível ao acesso aos bens já produzidos. 16 Ver: Robin Hahnel, Green Economics: Confronting the Ecological Crisis, Taylor & Francis, 2010, 288 páginas. 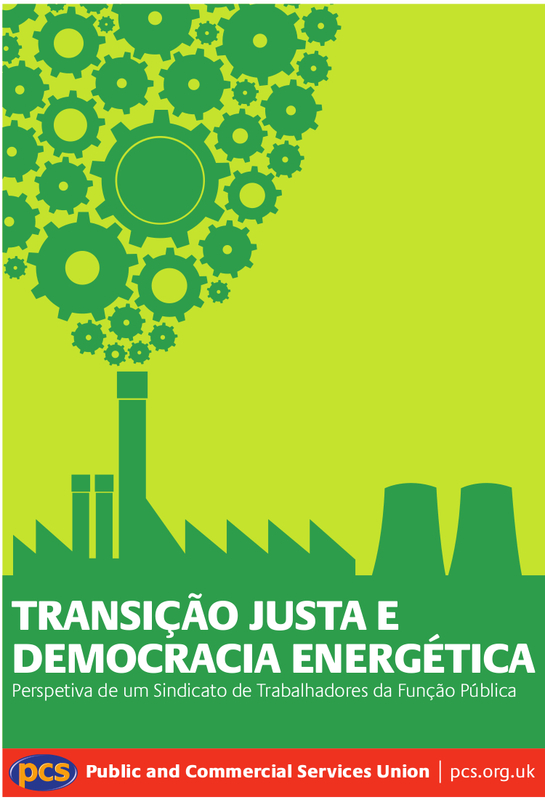 18 Sean Sweeney e John Treat, Energy Transition: Are We Winning?, Trade Unions for Energy Democracy Working Paper No. 9, Janeiro de 2017. 19 Para ser claro, não vou usar nenhuma definição categórica do socialismo neste capítulo. Vou brevemente rever algumas das experiências auto-declaradas como socialistas. Uma análise mais aprofundada, que inclui outros estudos de caso (particularmente os exemplos autênticos do Sul Global) exigiria um artigo separado. 22 Ver: https://www.systemchangenotclimatechange.org/ & http://climateandcapitalism.com/ . 24 Jess Worth, Ending the Oil Age, The New Internationalist, Novembro 2014, Número 477. 25 Naomi Klein, This Changes Everything: Capitalism versus The Climate, Siman & Schuster, 2014. §0. Quando falamos sobre alterações climáticas, muitas pessoas me perguntam: “Mas o que posso eu fazer no dia-a-dia?” A minha resposta é: torna-te um/a ativista polític@ no teu dia-a-dia. Organiza ação coletiva contra os criminosos do clima. Isto não só é mais divertido, mas também muito mais eficaz. E quando digo mais eficaz, quero dizer muuuuuuuuuuuito mais eficaz. §1. As emissões de gases com efeito de estufa em Portugal são 7 toneladas per capita por ano. Ou seja, uma pessoa média em Portugal emite o equivalente a 7 toneladas de CO2 durante um ano. * Ora, os níveis sustentáveis que temos de atingir mundialmente são 2 toneladas per capita por ano. Vamos ver então as nossas opções. §2. Se calhar és um franciscano ecológico. Assim i) partilhas a tua casa com mais três pessoas, ii) nunca usas aquecimento, iii) usas eletricidade só para as necessidades básicas, iv) nunca viajas entre cidades, v) usas só transportes públicos e isso também só para ir ao trabalho, vi) nunca comes carne, vii) compras só alimentos locais, viii) nunca compras roupa, ix) evitas produtos com embalagens, e x) nunca vais ao cinema ou ao teatro. §3. Vejamos. Produzes 7 toneladas de emissões. Tens de chegar a 2 toneladas. Mas se fizeres tudo tudo tudo o que podes fazer no teu dia-a-dia, nem sequer consegues descer até às 3 toneladas. Isto porque vivemos num sistema socioeconómico em que as nossas escolhas como consumidores/as são predefinidas pela linha de produção. §4. Então, austeridade ecológica não resultou. §5. Assim reduzirias as tuas emissões a zero. §6. Mas as emissões do mundo continuariam. Portanto, se te suicidasses e te encontrasses com @(s) teu/tua(s) deus(e/as) ecológic@(s), ele/a(s) mandar-te-iam para o inferno ecológico (para seres queimado/a como biocombustível com zero emissões líquidas, para aquecer o paraíso ecológico) porque poderias ter convencido outras pessoas a suicidarem-se contigo e não o fizeste. Portugal tem de cortar as suas emissões nacionais em 60-70% em 15 anos. Isto quer dizer que terias de convencer mais de metade de população a suicidar-se, e terias 15 anos para fazer isto. Ou seja, as emissões de um/a habitante de Portugal devem tornar-se negativas em 15 anos, algo que não podes atingir ao morrer. E nem seria suficiente matares outros/as portugueses/as. Terias de matar estrangeiro/as também, e especialmente crianças. §8. Bolas! Se a única solução individual para um planeta habitável é matar pessoas em massa, porquê fazê-lo? Combatemos as alterações climáticas exatamente para isto não acontecer. Será que existe outra solução? C) Podes participar em ativismo climático. §9. Em maio de 2016, dentro da quinzena de ação global “Liberta-te dos combustíveis fósseis”, mais de 30 mil ativistas em 6 continentes participarem em 20 ações de desobediência civil em massa em sítios-chave, bloqueando minas, portos, centrais a carvão, zonas de fracking e mais. §10. Na Lusitânia, Alemanha, ocorreu a ação Ende Gelände. 3500 ativistas ocuparam a maior mina de carvão na Europa durante uns dias, fisicamente bloqueando 24 547 toneladas de emissões de dióxido carbono. Isto perfaz 7 toneladas por pessoa. §11. Então, podes passar três dias do teu ano a participar numa ação direta contra a indústria dos combustíveis fósseis. E se és uma pessoa média e se participaste na Ende Gelände nesse ano, as tuas emissões anuais foram: ZERO! E se prestaste um pouco de atenção às escolhas do teu estilo de vida, se calhar até tiveste emissões negativas! §12. Claro que se curtiste estar do lado certo da história, se os sentimentos de solidariedade, unidade e justiça te fizeram mais feliz, então podes fazer mais do que uma ação por ano – se calhar menos confrontativa. §13. Como é óbvio, o objetivo destas contas não é desvalorizar os esforços envolvidos na organização, preparação e divulgação duma ação deste género. Muitos autocarros foram organizados a partir de dezenas de cidades europeias. Houve treinos de ação. Houve um acampamento. Houve enorme trabalho para montar equipas médicas e apoio legal. Podes ajudar em cada uma destas tarefas e assim seremos mais fortes da próxima vez. Uma ação direta de 3 dias não acontece espontaneamente, ela precisa de trabalho de preparação que demora meses. §14. O objetivo também não é sobrevalorizar as ações só por si. A quinzena “Liberta-te / Break Free” foi parte das campanhas locais já existentes e serviu para a limentar estas lutas, que noutros momentos usam táticas diversas para parar estes projetos poluentes, como comunicação direta, sessões de esclarecimento, ações criativas e manifestações. Podes ajudar em tudo isto, e quem sabe, se calhar um dia destes uma campanha diversificada fará uma das maiores empresas privadas de carvão falhar. Espera, mas isto já aconteceu em abril de 2016! Em qualquer caso, as maiores empresas do mundo continuam a ser os maiores poluidores e temos um caminho longo pela frente. §15. Para além disso, a justiça climática não pode ser reduzida às emissões. 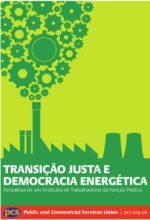 Justiça climática tem também a ver com pobreza energética, racismo, habitação, captura do poder pelas empresas via tratados de comércio livre, e – se calhar o mais importante – com paz. Tenho a certeza de que podes encontrar a área que mais te toca e envolver-te em ativismo nesta área. Todas estas lutas são lutas pela justiça climática. §16. Finalmente, a luta entre as narrativas individuais e narrativas coletivas é uma luta ideológica. Os neoliberais querem isolar-nos, querem tornar-nos meros “consumidores” atomizados, querem reduzir o nosso poder e a nossa capacidade financeira. 3500 pessoas separadas e isoladas não poderiam parar mina alguma. Juntas e organizadas, conseguiram fazê-lo. E é certamente este o pesadelo das elites económicas. §17. As escolhas individuais consistentes com o mundo que queremos construir são eticamente relevantes, mas não são politicamente eficazes. Os números dizem-nos que, se queremos evitar um colapso civilizacional, temos de rapidamente nos organizar e mobilizar. Junta-te à luta, ajuda nas campanhas existentes, traz novas ideias, faz parte desta oportunidade histórica para mudar tudo, antes que o clima o faça. * Emitimos também metano, etc., por isso usamos a unidade CO2e, que é “equivalente de CO2”. Ou seja, nestas contas, todos os gases com efeito de estufa estão incluídos. ** Existem várias formas de calcular a tua pegada de carbono. Usei os números daqui porque chegam a um valor pequeno: http://www.carbonindependent.org/ . Depois, há também este calculador http://www.carbonfootprint.com/ e este outro: http://footprint.wwf.org.uk/home/calculator_complete . O último é só para o Reino Unido, e o resultado da mesma conta seria 6.7 toneladas. Ou seja, um franciscano ecológico inglês conseguiria chegar aos valores médios dum/a habitante normal de Portugal. Ele considera 1000 pessoas, ou seja todas as pessoas que nós podemos influenciar diretamente. Estas pessoas vivem uma média de 80 anos. Assim, emitem uma média de 480 mil toneladas de CO2e em toda a sua vida. Contudo, a central termoelétrica de Sines emite ~6 milhões de toneladas de CO2e num só ano. A conclusão do Luís é que se estas mil pessoas lutassem durante 80 anos com convicção e a única vitória delas fosse conseguirem fechar a central de Sines um ano antes do plano do governo, isto seria uma luta 15 vezes mais eficaz. No fim de semana passado, 45 ativistas de 15 países europeus juntaram-se em Bruxelas numa reunião estratégica convocada pela 350. Falámos sobre “iconic fights” (lutas inspiradoras contra as infraestruturas de combustíveis fósseis, como a luta contra exploração de petróleo e gás em Portugal), campanhas distribuídas (campanhas que mobilizam as pessoas que não vivem nas linhas de frente e quando não houver uma dinâmica internacional como marchas pelo clima – por exemplo a campanha Empregos para o Clima), e sobre como pôr justiça no centro das nossas lutas. Particularmente interessante foi a luta anti-fracking no Reino Unido, que tem uns 250 grupos locais(!). Recentemente fizeram ações diretas durante um mês inteiro: cada dia um outro grupo bloqueou um sítio diferente onde existe um (/potencial) furo de fratura hidráulica. Em breve teremos alguns ativistas a visitar-nos cá em Portugal e partilhar as suas experiências. Também esteve presente o Ende Gelände, o coletivo alemão que organiza ações de desobediência civil com milhares de pessoas, em que ocupam uma mina de carvão simbólica. A próxima ação vai ser durante a COP-23 em Bona, e o Climáximo vai estar lá. Camaradas da Itália apresentaram a luta popular contra o gasoduto TAP (Trans-Adriatic Pipeline, a última parte dum gasoduto entre Azerbaijão e Itália), e ouvimos também sobre o MidCat na Catalunha. As novas infraestruturas de gás natural é um assunto pouco discutido em Portugal, apesar dos planos de construção de 160 km de gasodutos entre Guarda e Bragança. Finalmente, as conversas sobre justiça fizeram-nos pensar sobre inclusão. Vamos brevemente experimentar algumas ferramentas que podiam potencialmente ajudar a participação política das pessoas que não conseguem ir às nossas reuniões semanais. Aproveitamos para convidar toda a gente preocupada com as alterações climáticas às nossas reuniões, terças-feiras às 19h30 no CIDAC. I have two friends who recently had their second daughter. Then, there is this new article and its high pitch repercussions that tell me that the best thing I can do to save the climate is to kill that daughter. I have a few more brilliant ideas on this. §4. Even more relevant is that these are personal choices after the fact. The so-called “high impact choices” are, and I am quoting, “live car free”, “avoid one transatlantic flight”, “buy green energy”, “buy more efficient car” etc. This means, if you want to make the biggest cuts in emissions, the first step is to be rich enough to have a transatlantic flight you can cancel. Marvellous news. And I mean, the article is correct in its own fashion: if there are no humans, then there is no human-caused climate change. Problem solved. I haven’t met my friends’ second daughter yet. But I have some little “flirts” with the older one (by flirt I mean the 3-year-old saying my name and me saying her name, in loop… not very cute for others present, but we have our own ways.). Is the newcomer just another consumer? Just another “greenhouse gas emitter”? A climate killer? Is it scientifically irrelevant that she could be our long-awaited union leader who reinvents the labour movement? Is it invisible to the emissions accountant that she could be inspiring thousands into acts of civil disobedience for climate justice? §7. We have to stop the accountants. Immediately. The problem is not with the numbers, but with the system. And this is super-easy to see: In any part of the “developed” world, it is technically impossible for any person to remain below the sustainable emissions threshold via individual choices. Something bigger, much bigger, has to change. If she would get slightly politicized, she could earn huge “negative emissions” in the accountants’ papers by winning a fight for public transport. If the accountants would get slightly politicized, we would find out what the “government recommendations” actually “miss”. “The most effective individual actions” are when you get involved and take collective action. Stop the accountants. Let’s talk politics. My “accounting” for activism versus individual solutions, here: Activism: It’s better than dying . I basically calculated that, to remain within the sustainable per capita emission budget, you would have to commit suicide. I also calculated that direct actions are even more effective than that. Eu sei que ainda sou muito “estrangeiro” na cultura portuguesa e que tinha uma experiência particularmente excecional em Portugal (sempre entre pessoas progressistas, humanistas, com pensamento crítico etc. 🙂 ). Mas tinha pensado que sabia algumas coisas sobre Portugal em geral. Ontem estive numa sessão pública organizada pelo Ministério do Mar sobre a Extensão da Plataforma Continental Portuguesa. Aqui podes ver o que está sob controlo do estado português, e a extensão que querem. Demorei quinze minutos na conferência para perceber que a referência não era à sardinha, bacalhau, praias, surf etc. Que pollyanna que estive, foi “corrigido” brutalmente durante duas horas. A Ministra do Mar, quem esteve a vender o mar nos Estados Unidos, abriu o evento. As seguidas intervenções tinham referências diretas a “Alargar Portugal” e ao “Conhecimento, Conhecimento, Conhecimento”. Pensei: pronto, isto me parece século quinze, mas se calhar não percebo bem o que estão a dizer. Especialistas em geologia mostraram vídeos e fotos dos animais e plantas bonitas. Não percebi bem, mas disseram várias vezes que não eram biólogos (e não houve intervenção de nenhum biólogo). Mas então porque é que estamos tão entusiasmados sobre um dos maiores chocos naquela área, sem saber nada sobre ele? Em fim, finalmente houve um slide que disse: “Para quê?” As repostas foram claras: recursos vivos (para cosmética e medicina) e recursos não-vivos (combustíveis fósseis, fósforo, diamantes, areias, e vários minerais (como níquel, cobre, ouro, zinco e cobalto)). Num slide foi dito que estão a aproveitar a costa continental para os combustíveis fósseis, e dois slides depois houve a tal foto famosa do Acordo de Paris, porque o slide seguinte era para dizer que para os carros elétricos a gente precisava de baterias (e por isso de níquel). Genial, né? Sinceramente, não estive preparado para tantas referências diretas ao colonialismo e não estive preparado para um discurso destes ter aplausos de dezenas pessoas, no espaço público. Nota-se uma semelhança interessante entre o colonialismo e o extractivismo moderno, quando estas pessoas olham às “zonas ainda não descobertas” e vejam só coisas (vivas e não-vivas) para extrair e explorar.